I wear perfume on a daily basis - even if it's a pyjama day because it always makes me feel better when I smell nice! One of my favourite fragrance brands is (and always has been) Armani - who remembers City Glam? 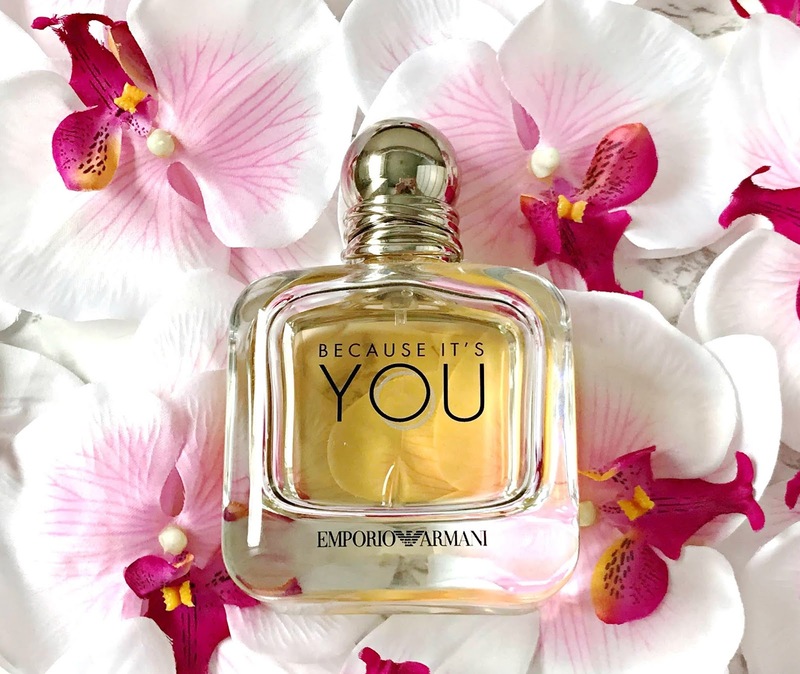 Because It's You was released last year and it's still one of my most worn perfumes so I wanted to review it today and let you know that Superdrug currently have £10 off the 50ml bottle at the moment in case you feel like treating yourself or a loved one! I love the simplicity of the bottle - it feels weighty and luxurious, with the name of the fragrance written on the front and the lid. The cap is designed to represent the rings worn by Giorgio Armani and his partner and the cap is also on Stronger With You - the matching male fragrance. It's recommended that you spray the perfume and aftershave in a double ring motion over your head to allow the fragrance to envelop you although this isn't strictly necessary! When describing perfumes, I will usually categorise into genres: fresh, fruity, floral, musky, sweet etc but Because It's You is all of those things so I can't put just one label on it. The top notes are Neroli, Raspberry and Blackcurrant, the middle notes are Rose, Jasmine and Violet Leaves and the base notes are Patchouli, Musk and Vanilla. When I first spray it, it smells fresh and a little fruity but I find that over time, it also smells musky and warm, due to the vanilla. Throughout the day, I can smell all of the notes but none is overpowering and they all work very well together. My husband always smells the fruit notes but they aren't sickly sweet, I personally always smell the neroli and vanilla. Neroli is a scent that I am always drawn to as it prevents any fragrance from being too sweet or sharp and I find it fresh and combined with the ingredients in this perfume, I would describe it as sparkling. What I love most about this perfume, is the wear time - I can smell it for a good 7/8 hours after applying and still get a hint of it up to 9 hours later. It's perfect for both day and night wear and is feminine without being too floral or cloying. If you like the sound of Because It's You, you can purchase from Superdrug and avail of their £10 discount. Is it too early to mention Christmas? It would make a beautiful gift! All products are bought by me, unless otherwise stated. Opinion is always my own. This perfume was kindly sent to me. Affiliate links may be used.